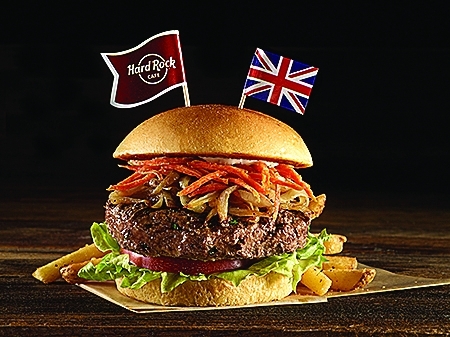 For the first time ever, Hard Rock Cafe Tenerife gives guests a backstage pass to sample Local Legendary Burger offerings, showcasing the flavour and ingredients as part of its new World Burger Tour menu. 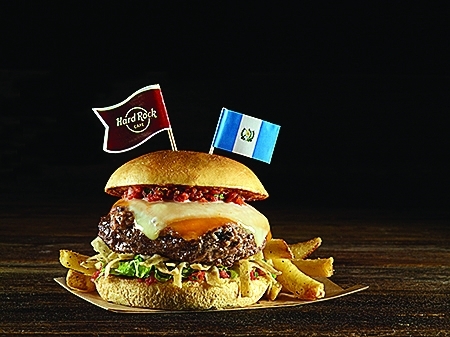 08.06.2015 - These unique burger ‘acts’ from three continents will take centre stage at Hard Rock Cafe Tenerife in Playa de Las Américas until June 30, 2015. The restaurant chain gives their chefs complete freedom to create a unique Legendary Burger that captures the flavours of their area and that’s only available at that cafe location…until now! 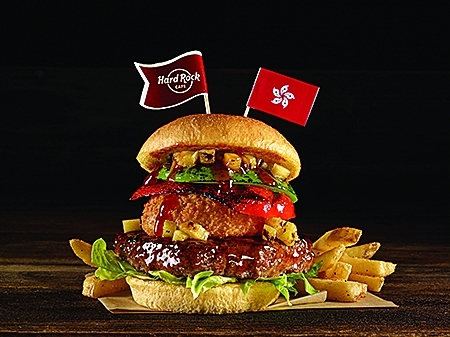 More than 150 local burgers have been evaluated by Hard Rock’s culinary team, with fans’ favourites selected for a limited-time World Burger Tour menu. 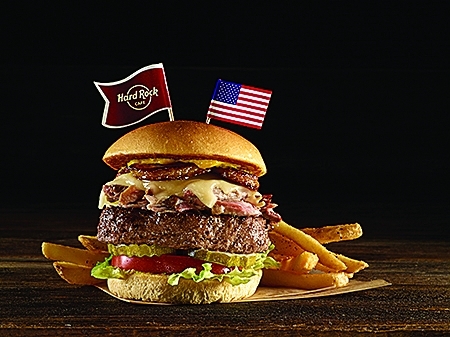 The four burgers chosen will be featured at Hard Rock Cafe Tenerife in addition to its unique Tenerife Local Burger, prepared with a typical Canarian cheese sauce. • Marimba Burger – This Guatemalan Legendary features a beef patty topped with a spiced chipotle and jalapeño layer of beans, fresh salsa, Monterey Jack cheese, cheddar cheese and crispy tortilla straws. • Sweet and Sour Burger – This Chinese burger features a beef patty topped with a fried onion ring, bell peppers and grilled pineapple drizzled with homemade sweet and sour sauce. • Lancashire Hot Pot Burger – The English Legendary features a juicy lamb burger broiled until tender and topped with caramelised onions, crispy carrot frazzles and mint mayonnaise. • Cuban Burger – This American Legendary from Miami features a beef patty topped with marinated pulled pork, melted Swiss cheese and sweet plantains. • Tenerife Local Legendary Burger – This Canarian burger features a beef patty topped with a typical Canarian sauce. Just like the artists whose memorabilia line the walls at Hard Rock locations worldwide, the burgers they serve are nothing short of ‘Legendary’! • Mai Tai One On – A South Pacific-inspired cocktail that features a refreshing blend of Mount Gay Eclipse Rum, Cointreau, Monin Orgeat, a splash of lime, and orange juice. • Pomegranate Mule – A mix of Absolut vodka, Monin pomegranate and ginger beer make this summertime favourite from Russia. • Mezcarita – This refreshing margarita which hails from Mexico is a perfect combination of Del Maguey Mezcal, Cointreau, Malibu and fresh strawberries. • Pineapple Ginger Caipirinha – A Brazilian blend of Agua Luca Cachaça and pineapple with the subtle hint of Domaine de Canton ginger liqueur. • Maple Old Fashioned – A twist on a classic American cocktail that features bourbon, cherries, maple syrup and orange juice garnished with a crisp bacon stir stick. With a total of 199 venues in 63 countries, including 153 cafes, 21 hotels and 10 casinos, Hard Rock International (HRI) is one of the most recognised companies in the world. The franchise owns the world's greatest collection of music memorabilia, which is displayed at its worldwide locations. Hard Rock is also known for its music-related merchandise, performance venues and an award-winning website. The company owns, operates and franchises in iconic cities such as London, New York, San Francisco, Sydney and Dubai. HRI also has hotel and casino properties worldwide. Upcoming new locations include San Juan, Rio de Janeiro and Marrakech. New hotel projects include Daytona Beach, Dubai, Los Cabos, Shenzhen, Abu Dhabi and here in Tenerife. For more information visit www.hardrock.com. Produced with news.CMS in 0,0695 seconds.